The Canadian Hunger Count stated that in March 2016 alone 863,492 people used a food bank in Canada. This was a 28% increase from 2008 (Food Banks Canada, 2016). However, in Canadian society food banks still have social stigmas attached to them and the members who use their services, affecting their funding and use by the public in times of need. 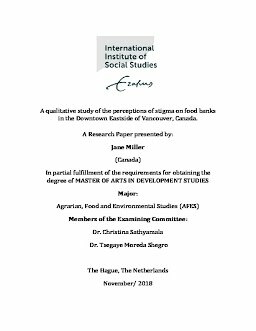 This paper address what role stigma plays in the community perception of food banks in the Downtown Eastside of Vancouver, Canada. The theoretical framework focused on stigmas in the welfare state, structure and agency, and conservative ideology. Participants were separated into groups that categorized their food bank membership status and their income level. The results yielded that past and present food bank members felt disrespect embarrassment, fear, and hopelessness when they went to the food bank food distribution service. These emotions were caused by the disrespect towards members that came from poor food quality and inappropriate food with low nutritional value in addition to the underlying social stigmas against food banks that have been encouraged by a society that was built on conservative narratives. In a society that values independence and self-reliance, food banks are seen as a last resort and a personal failure. In reality food banks are the product of an inefficient government and dismantled welfare state that cannot support citizens.